It means stormy trips to the corn maze in muck boots and rain jackets, leaf-raking parties, and Bible trivia games — lit by flickering candlelight because the power went out in the middle of youth group. And let's not forget steaming mugs of apple cider around a bonfire! I'm experiencing a very different fall now that I've moved across the country. And as a result, I have not had my fill of apple cider yet this season! 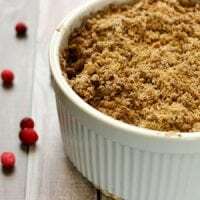 This apple cranberry crisp highlights all the flavors of a mulled apple cider — with a holiday twist of cranberries, and a lovely crispy crunchy topping. I found this deep oven-safe souffle dish in which to make my crisp. It has a 2-quart capacity and measures 8 inches across, so it fits perfectly in my 6-quart Instant Pot. Finally, this recipe is also grain-free, gluten-free, dairy-free, and egg-free, with a nut-free option. 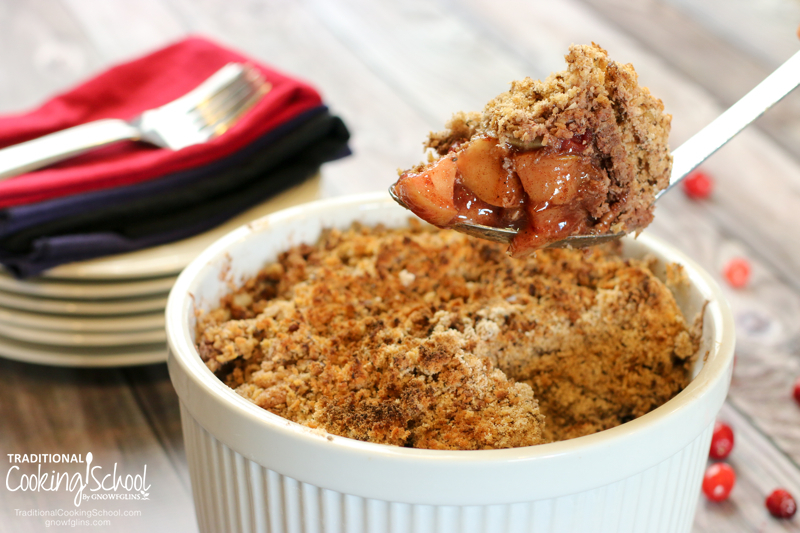 This apple cranberry crisp made in the Instant Pot highlights all the flavors of a mulled apple cider -- with a holiday twist of cranberries, and a lovely crispy crunchy topping. It's also grain-free, gluten-free, dairy-free, and egg-free, with a nut-free option! Serves 4 to 6. Combine cored and cubed apples and pears in the bottom of an 8-inch, 2-quart oven-safe dish, such as this one. Then add cranberries, lemon juice, sweetener, arrowroot powder, and spices. In a separate small mixing bowl, combine coconut flour, chia seeds, coconut, nuts if desired, sweetener, spices, and salt. Add coconut oil in small chunks. Then mix gently with a fork until evenly distributed. Layer topping over filling ingredients. Then make a foil sling to go under the baking dish (see how to make a foil sling here!). And make sure to reinforce your sling with extra pieces of aluminum foil, as this dish becomes too heavy for a single piece of aluminum folded lengthwise. Add 2 cups of water and a trivet to pressure cooker. Then, using the foil sling to transport, gently lower baking dish inside cooker. If using an electric cooker, set to high for 20 minutes. If using a stove-top cooker, bring to high pressure and maintain pressure for a cook time of 20 minutes. Once cycle is complete, if using an electric cooker, hit the Cancel button to turn off the heat. Then place a towel over the pressure release knob and allow pot to do a quick pressure release. When pressure is released, open lid. Carefully remove crisp from cooker using foil sling. For a crisper, crunchier top, place under the broiler in the oven for a few minutes until browned. Then serve with a dollop of whipped cream or ice cream. Enjoy! What do you love most about fall? 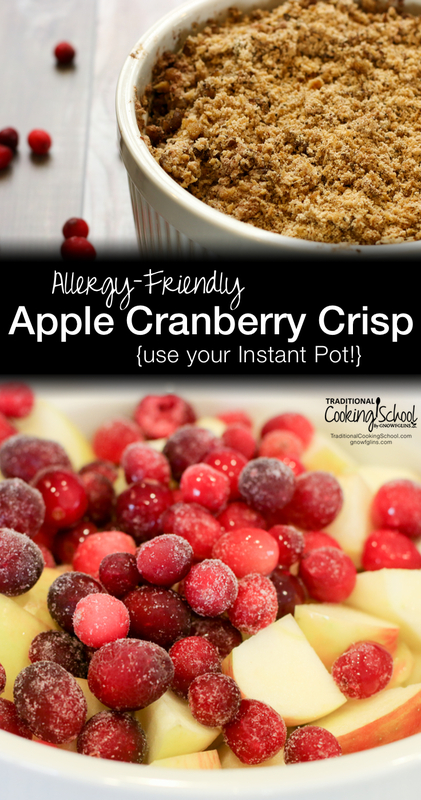 Will you make this Allergy-Friendly Apple Cranberry Crisp in the Instant Pot? Thanks so much for this recipe! It will even fit our newly adopted low lectin Matrix diet by Dr. Gundry. I might try making this for a Christmas event. 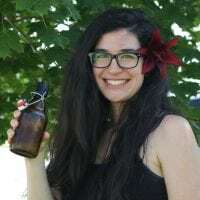 Is it possible to make this for the trim healthy mama plan, what would I use for the sweetener? Thank you, love your recipes ? I applaud your efforts to get this into a 2 quart dish! I followed this recipe exactly and a 2 quart dish was not big enough. I had to use a 2.5 quart dish and baked it in the oven. Although I couldn’t bake this in the Instant Pot, it was very tasty. Oh, sad! I wonder if my apples and pears were smaller than yours. 🙂 It was a close fit, but it sank after cooking, too. I’m glad you were able to enjoy it anyway! This looks delicious! Since I don’t have an Instant Pot would I change anything for baking in the oven? I adapted this recipe slightly for GAPS diet and oven baking and it turned out well! and I omitted the arrowroot powder. Then I baked it uncovered for 45 min in a 350 degree oven. You could use even less honey as I found it still sweet but otherwise I really liked it. It would go well with yogurt or ice cream or something too. Hi and thank you for creating such great resources for healthier living! I am still new to Instant Pot cooking and I’m wondering if the baking dish needs to be covered. I watched Wardee’s video about reheating food in the Instant Pot, and it was my understanding that you always need to cover any dishes you put into the Instant Pot. Is this correct? Thanks! Hi Brenda! As a general rule, I believe most dishes should be covered. However, this one does just fine uncovered. I know this sounds crazy, but I can’t eat chia seeds or flax seeds. I know that these are often used instead of eggs. I would normally just sub out the chia/flax for an egg in things like cake, but for this, should I just leave the chia out all together and not substitute it with anything? Is it being added for the superfood component, or does it help the texture? Would arrowroot powder or tapioca flour be helpful to thicken it, if that is part of the purpose? Thanks for your time and assistance! Hi Heidi! You can leave the chia seeds out without substituting for them — they’re there for the crunch factor but the crisp does just fine without. I appreciate your question and thoughtfulness! Hope you enjoy the crisp! I made this without the chia seeds and the family loved it!! Thanks for a great recipe!